1. Heian palace gardens. 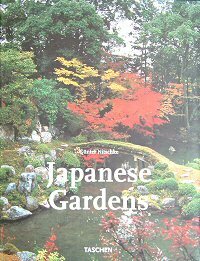 Large ponds, interesting rocks (the single most indispensable feature of the Japanese garden throughout history), winding streams, all oriented and arranged according to Japan’s version of Feng Shui. Designed to be enjoyed around the pond or boating on same. 2. The dry garden. This is most famous from the Zen Buddhist temple gardens consisted of raked gravelly sand, with occasional groups of interesting rocks in odd-numbered arrangements (groups of 3,5,7 were prominent), but had wider application, where grass-and-tree gardens had rock compositions suggesting dry ‘waterfalls’. Designed for meditation from the veranda of a temple building, or viewing from similar fixed points. 3. The tea garden – a path to the small and humble teahouse wending its way through a modest and rustic garden, quiet in colour, designed to create the right mental state (humility, calmness, receptiveness, etc.) while approaching the tea ceremony, and for recuperation between its stages (full-scale, it could take four or five hours). Carved stone lanterns and blocks with water-filled indentations first appear. 4. The garden designed as a series of scenes: paths took you from one carefully composed setting to another. Often these scenes (there could be a hundred or more in large gardens) were designed to evoke or symbolise some famous or mythical site, so we get mini-Fuji hillocks and so on. Strangely trimmed shrubbery, sometimes cubic in form, makes its debut. 5. The author is struggling a bit by the very varied modern era, and grasps at the new use of dressed stone, interesting rocks (still a mainstay) that are cut and carved rather than natural. The fact is that design now is much more varied in style and setting, and is often now centred on commercial buildings, in front of or even in the lobby area, and uses a very wide range of techniques and aesthetic approaches, for diverse purposes. The book is rather cursory in this area, sadly – its one weakness bar the very occasional moment of over the top mysticism by the author.